A Visual Feast: Roasted What? That's right, chickpeas. 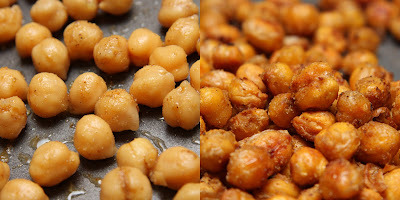 I can handle chickpeas on a salad and I definitely like them mashed up and made into hummus. But, roasted? This would be interesting for sure. Would they explode in that hot oven like popcorn? Would they just burn up into little bits of chickpea coal? There was one way to find out! This recipe was much less involved than the last one and I was excited about that. I only managed to make one chickpea fly in the air and I'm happy to report that it didn't land in my hair! 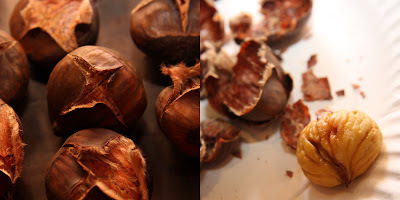 Below are before and after pictures of the little bits of roasted goodness. Yes, I said goodness. They were absolutely delicious and a bit addicting! Once I popped the first one in my mouth, I couldn't stop my hand from going back into the bowl! With chickpea guts flying everywhere...."
I haven't come up with the rest of the song yet, but I think you get the idea. Happy roasting!! Oh, and good luck controlling your hand. It's sure to be back in that bowl before you know it! I love these treats!! Sooooo yummy!! Chick Pea Popcorn?? Coal??? Too funny!! You always make me laugh right out loud!! Honestly, I thought those mushy little things were only good for hummus. Maybe soup? You did good! !